Jean Dubuffet was born on July 31, 1901, in Le Havre, France, to a middle-class family. Here he attended lycée until 1918, when he received his Baccalaureate. Dubuffet would later come to reject the time he spent at Le Havre as a student, claiming that his studies were “half-baked” and worthless. However, he read voraciously on his own in an attempt to foster his own education. As a youth, Dubuffet especially enjoyed reading the works of Dr. Hans Prinzhorn. Prinzhorn’s writings, Bildnerei der Geisteskranken in particular, often explored the powers of the psychopathic art of asylum inmates. Prinzhorn drew endless comparisons between these inmates’ artwork and the artwork of children, two groups of unrecognized artists that fascinated Dubuffet. For Prinzhorn, animal instinct and savagery, as embodied by inmates and children, led a person to spiritual strength and harmony with the universe, rather than to neurosis. These very concepts explored by Prinzhorn would later show up in Dubuffet’s personal artistic tastes and style. In 1925, Dubuffet returned to Le Havre. There, he met his first wife Paulette Bret, whom he married and with whom he had a daughter two years later. In 1930, Dubuffet moved to Paris and founded a small wine business with his family. Dubuffet once again claimed to prefer the simple life of the grounded “common man” and tried to live true to his philosophy by working as a businessman. He believed that this sort of lifestyle would have a positive effect on his artwork, as he considered the commoner to be much more in touch with art and poetry than any academic. He set out to amuse the average man through his own artwork, which he continued to do on the side. A few years later, things began to fall apart for Dubuffet. In 1933, he separated from his wife, and he soon became bored with the family business. He dissolved his part in it in 1934 to concentrate on his search for a popular art form that could be grasped by all. In 1935, Dubuffet married his second wife, Emilie Carlu. The two moved to a house on rue Lhomond, where they constantly entertained and worked. The house was “a workshop, a theater, a little carnival” all at the same time. Dubuffet played his accordion regularly and began experimenting with different art media, such as wood and plaster. In addition, he found a passion for portrait painting and marionette sculptures. In these works of art, Dubuffet depersonalized most of his subjects, comically exaggerating proportions and idiosyncrasies. His artwork received no public attention and no success at this point, though, as the critics found it hard to understand. They saw his painting as crude and childish and compared his work to graffiti done in cement. Consequently, Dubuffet became disenchanted and begun to doubt his artistic talents. He returned to the family business in 1937. Five years later, Dubuffet picked up the paintbrush again. This time around, he attempted to strip himself completely of acquired culture in order to find an artistic innocence like that of the asylum inmates in Dr. Prinzhorn’s book. He was in search of a lucid, pure style, and he began to believe in the powers of alienation. To Dubuffet, the anti-social and isolated artist working for personal pleasure and satisfaction created the most effective artwork. During this stage, Dubuffet’s paintings whimsically featured the countryside and included little, awkward and strangely tilted figures of cows and milkmaids. These interests were quickly replaced by an interest in urban people and environments. In addition, Dubuffet particularly enjoyed painting the banal, as he claimed that exceptional people and places did not interest him at all. Thus, in his paintings of urban landscapes, individuals are found in cramped places, lost among the masses. He did not paint the wide boulevards of Paris, but rather the narrow alleyways of high tenements. His subjects were often depersonalized and drawn as simple stick figures. To Dubuffet, beauty and ugliness were not separate — in fact, ugliness did not even exist. Consequently, he portrayed his subjects, most often victims of tough, everyday urban life, in a whimsical and humorous light. In 1944, Dubuffet held his first solo art exhibition at the Galérie Rene Drouin in Paris. Dubuffet later became obsessed with texture, as is manifest in his portraits of urbanites like The Smoker by a Wall (1945). He began to concentrate upon the old and dilapidated surfaces of the city — stone and cement, granite and anthracite. He became consumed by his close examination of these materials and their textures, and he decided he had no need for color in his artwork. Dubuffet believed that the dark, monochromatic surfaces had much life and vibrancy. His preoccupation with texture also applied to Dubuffet’s choice of materials. He preferred old, discarded material and combined them in complex medleys. Some note that Dubuffet was able to create a new, dense reality out of these combinations. This textural artwork was first exhibited in the United States in 1947 in New York City. One of Dubuffet’s most significant travel experiences was his extended trip to the Algerian Sahara. Unlike his fellow artists, Dubuffet did not paint his African-influenced paintings in a condescending light. He did not paint as a member of higher civilization, and he did not paint picturesque landscapes and exotic animals. Rather, Dubuffet chose to paint natives in his classic, innocent, and chimerical style. 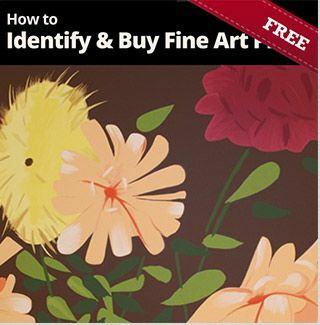 This is apparent in paintings such as Arab on a Camel (1947-48) and Fluting on the Hump (1947). Eventually, Dubuffet learned Arabic so that he could live side by side with his subjects for a brief while. 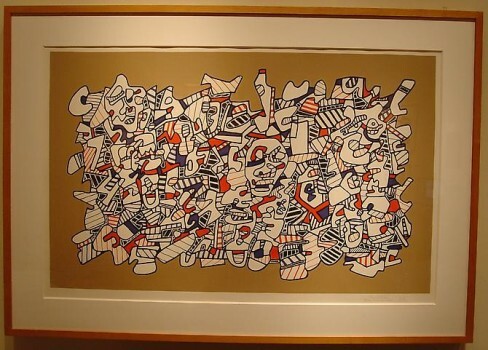 In 1948, Dubuffet and several other art aficionados officially established an Art Brut collection, modeled after the art collection of Dr. Prinzhorn. Shortly before he collaborated with art collectors, such as André Breton and Charles Ratton, Dubuffet made a trip to Heidelberg to see Prinzhorn’s collection of art created by the mentally ill. Like Prinzhorn’s collection, Dubuffet’s Art Brut collection showcased works of various media. The common thread between these works was that the creators were not professional artists. Rather, the works were painted by created by commoners — especially asylum inmates and children. Dubuffet saw these primitive pieces as a vibrant alternative to the tired artwork of Western culture, and he would often go with Breton to flea markets around Paris’s northern city boundaries in search of these sorts of works. In 1949, Dubuffet once again became interested in painting landscapes. His landscape paintings during this stage, called the Grotesque Landscapes, are marked by free execution and childlike charm. Dubuffet loved to paint spontaneously, and he preferred using light colors with his landscapes — a drastic change from the blacks and grays used in his portraits. Limited scratches and abrasions indicate topographical features, though his paintings in general retain a flat quality. When figures appear in Dubuffet’s landscape paintings, they are often found in unimaginable, depth-less relations to the ground. Similarly, objects are placed in different perspectives throughout the canvas, some from side elevations, some from the front, some from below, and some from above. Probably the most important pieces created by Dubuffet are part of his Hourloupe series. This series began as a bunch of doodles done with a ballpoint pen, though the series gradually evolved to include felt-tip pen drawings. Dubuffet liked the hard, unaccented line created by these pens. Furthermore, pens were instruments of the common man, whom Dubuffet greatly admired. With his Hourloupe series, Dubuffet also explored color even further. He arbitrarily restricted himself to a palette of red, white, blue, and black, making the function of color non-expressionist. Besides providing an opportunity to explore color, the Hourloupe series greatly influenced Dubuffet’s sculptures of the 1960s. In 1966, he started to create large three-dimensional sculptures in the Hourloupe style; five years later, the culmination of the Hourloupe sculptures developed as the Coucou Bazar, the Hourloupe Ball. The Coucou Bazar, a huge performance act entirely orchestrated by Dubuffet, was first staged in 1973 at the Guggenheim Museum in New York and featured the visual arts, theater, dance, and music. 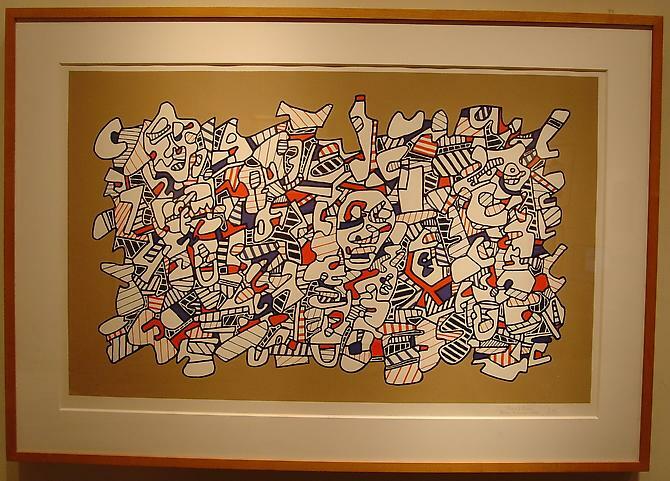 Dubuffet gave new life to artwork through this artistic extravaganza and smorgasbord. From his mid-1950s until his death, Dubuffet took part in various retrospective art exhibits across the world. The exhibits showcased some of his best works, from his perceptive portraits to his intuitive landscapes. Dubuffet often said that the only way to get noticed is to do things the wrong way; in so doing, new insights can be gained into the characteristics of old, common things. Dubuffet continued to gain worldwide attention and critical praise up until his death, which occurred in Paris on May 12, 1985.